Madhuri Dixit Ne *Humein Maar Daala* & Her Emerald Green Saree Is To Blame! I don't believe there is even one Bollywood loving individual who doesn't recognise these iconic lyrics. It might be a song about terrible heartbreak but in our case, the lyrics would hold a more literal meaning. 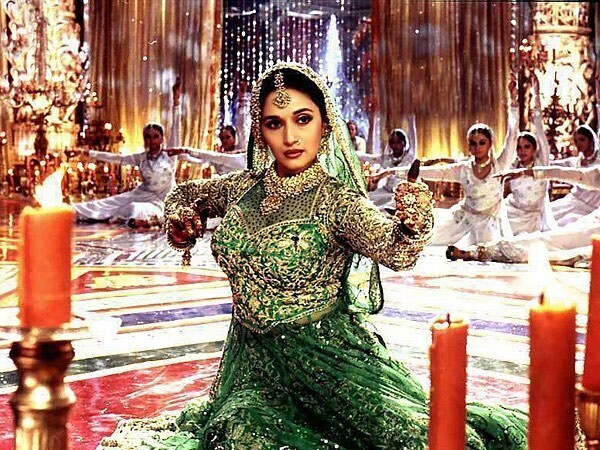 Every time Madhuri Dixit wears green, I'm reminded of this Devdas song, but it has never been as meaningful as it is today. This time, she hit it out of the park with her edgy-elegant emerald green saree gown and we're overjoyed. ...and in Hum Aapke Hain Koun, a silver and green lehenga set. Her newest saree is no different. 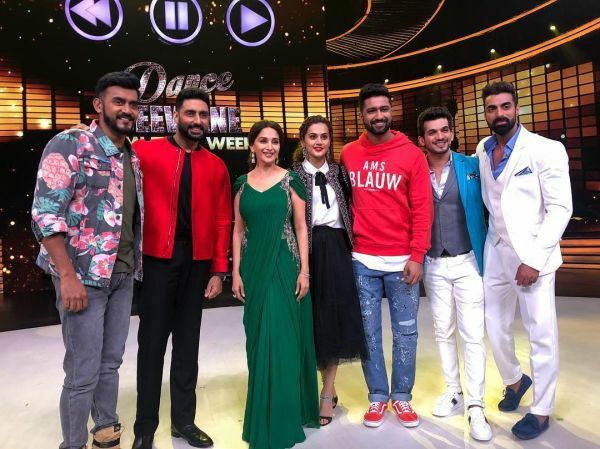 Madhuri wore an immaculately draped saree by Gaurav Gupta for an episode of the dance show she's a judge at. The striking green is not the only highlight of her Indian ensemble - Gaurav Gupta's signature embellishment down the side of the saree gown is another. It's common knowledge that Mrs Dixit Nene puts everyone around her in a trance and her outfit just added to that effect. The cast of Manmarziyaan, including Taapsee Pannu, Vicky Kaushal, and Abhishek Bachchan, looks as enamoured by her in this green saree gown as we are, don't they? Madhuri Dixit is such a celebrated star, so naturally, her jewellery to match the glorious saree gown was fit for a queen. Wearing emerald and diamond drop earrings, a matching ring by AS Motiwala, and bangles by Gehna Jewellers, Madhuri glittered all night. Add to that her flawless and sober makeup and, like we said, you've got a knockout look. Excuse us, while we shop for something green, which is now our favourite colour. It's safe to say we're fangirling, isn't it?